Data can be complex, however, getting the right answers for your business shouldn’t be. Insights need to be readily available, in fact, they need to be instantly available to everyone and anyone regardless of their technical abilities. KAPs BI tool makes it easier for you to reveal business insights, simplifying every step of the analytics process, from data preparation to analytics and collaboration. You will be able to answer questions that you didn’t know you had, share your discoveries, and ultimately make data your most compelling partner in archiving your individual or organizational goals. What does our BI tool do for you? Individual analytics. With our BI tool, you have the power to harness your data, elevate your insights and discover new exciting opportunities. 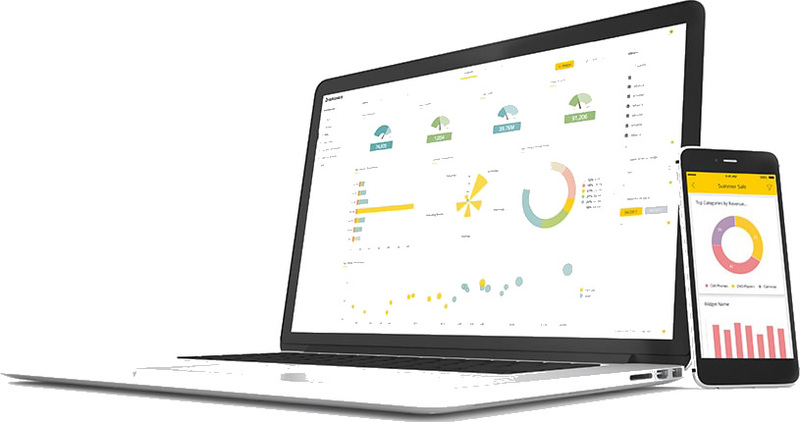 Our tool lets you experience the power of data through your analytical journey. You will be able to stay in the flow of analysis, from prep, analytics and finally collaboration. KAPs BI for Teams and Organizations. You might be wondering how you will be able to turn people’s collective potential into your competitive advantage? Well, all you need to do is arm them with data. Unlock their curiosity and unleash their creativity. With our BI tool, your teams will be able to work smarter and faster; this is because they will have the advantage of a seamless end-to-end analytics experience. When it comes to preparing for analysis, our tool will let you build data sources and dashboards; publish and share your content, and collaborate. You will have the power to do all this with the governance and security you require. Embedded analytics. You will be fast when it comes to creating and marketing your product. Think of it like this; your clients will be able to access powerful analytics, from your application or product. With our embedded analytics solution, you will be able to do just that. Your customers will get access to powerful industry-leading analytics capabilities that will drive your product engagement, and ultimately, customer satisfaction. With the KAPS BI tool, you will be able to easily market with a solution that is very easy to customize, integrate and deploy. Our software gives you the peace of mind to stay focused on your area of expertise while letting our BI tool take care of the analytics. For the best use of your resources. Let your staff focus on what they do best: building a superb product. And let KAPS worry about delivering analytics that is powerful, fast and easy to use. Analytics, your customers, will love. You will have the advantage of delivering flexible visual analytics to your clients quickly and easily embedded in the top of the industry loading dashboards that will make your solutions standout. Ultimately, this should empower your customers to gain value from their data. A quick go-to solution. Integrate, deploy and get to the market faster with our detailed embedded solution. We’ve got your back from customers support, product training and roadmap collaboration, we are focused on your client’s happiness. Together all the way. From the initial concept stage to deployment, you can think of KAPS as your extended team. We are here to help you get customer satisfaction. You have access to our active developer community, learn from our training, and be part of our product collaboration. Interested in exploring your business potential? Call or email us through bi@kaps.co.ke our customer care representatives will be more than willing to assist you.